What Makes SPU Students “Heroes”? 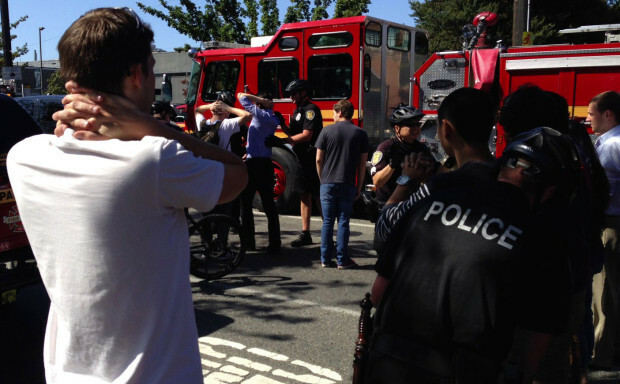 Several students stopped a gunman Thursday in yet another shooting, this time at a Seattle university, cutting short his killing spree. It’s notable that the person who first tackled the gunman used pepper spray. I can’t say how many times I’ve been scoffed at for carrying pepper spray as my (only) self defense tool on my journey. “It won’t help you when someone else has a gun,” I’m told. This is a case where someone with only pepper spray not only defeated a gunman, but almost certainly saved many lives. The same person exercised incredibly good judgment. They ran up and tackled the gunman just as he paused to reload. Had they run in blindly they would likely have been shot themselves. This is a great example of how true heroic action isn’t just brave, it’s also practical and that is why it succeeds. It’s also a great example of how when one person acts, everyone else just watching will, too. Once the first hero sprayed and tackled the gunman, others ran in to help hold him down. The person who tackled him most certainly is a hero, even by my own strict definition. It doesn’t matter that he was on the job as a building monitor; building monitors aren’t police officers or even security guards, and are not expected to defeat criminals. His training as a monitor was most likely to call security or 911. He exceeded that duty for the sake of others, and acted both intelligently and courageously. That’s a true hero. Of course, had our hero had a gun instead of pepper spray, he may have made matters worse; there were clearly a lot of people around and more bullets in the air could easily have endangered bystanders. Glad you commented on how the hero chose his timing; I wondered how you with analyze that. This is actually one area where a gun advocate could critique the fact that more citizens don’t carry guns. In theory, if the hall monitor was a proud NRA member and carried his gun everywhere, he could have just straight up shot the bad guy at the first sound of gunfire. He could have simply popped out of the doorway and shot him down. Instead, since he had no gun, coming out right away would have been suicide – he never would have reached pepper spray range before being shot. Thus, had the same building monitor had a gun on him, there may have been less victims. As it was he had to wait for the guy to run out of bullets, and every bullet fired was a potential life lost. But I remain skeptical whether a second gunman firing into an area full of students would have been a good thing. Not only does it risk killing more bystanders, but now law enforcement have an even harder time knowing what’s going on. The actual bad guy was rumored to have an accomplice armed with a handgun (this actually prevented paramedics from entering right away) and if the building monitor had been armed, police may (rightly) have shot our hero when they saw him. Generally, adding more bullets to the scene of a shooting spree just isn’t a good thing, especially when those bullets don’t come from organized law enforcement who know who’s who and what’s going on. So I think the ol’ pepper spray to the face trick was a pretty good response, and waiting for the opportunity was clearly the best strategy given what the hero was working with. I’m one of those people who think that an armed guard might have helped, but I will give you the valid concerns about the police shooting him, if nothing else. Actually, in a way we agree… I think an armed guard is a fine idea. A uniformed security guard carrying a pistol seems fine to me. That gives us a trifecta of improvements over a gun-carrying citizen: he’s got formal training in how to handle these situations, he can radio for assistance before he goes out and confronts the guy, and both bystanders and police can see that he’s a security team member and not one of the shooters. It brings the power of a gun to bear on the situation without escalating either the confusion or the danger of shooting bystanders.